When Elijah was born nearly 7 years ago, Brad and I were the newbie parents, reading books and learning everything we could to help us adjust to life with our newborn little boy. 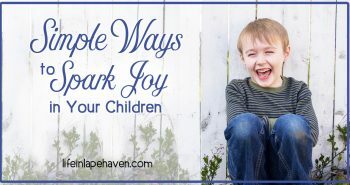 When Josiah joined our crew a few years later, we were much more confident in our parenting roles and our experience, but we continued to learn as we parented two very active boys. By the time Isaiah came along a few months ago, we had plenty of tips and tricks up our sleeves, but as it turned out there were a few things that we’ve discovered since his December arrival that I wished we’d known way back at the beginning of our parenting journey. This post contains affiliate links which means that, at no additional cost to you, I may receive a small commission if you use the link. Okay, actually this trick is something I’ve been holding onto for about two years or more. When I first saw videos and comments about it, Josiah was no longer wearing Onesies or other baby bodysuits, so Isaiah is the first child I’ve had a chance to try it out with. And you know what? It’s GENIUS! You know how the baby bodysuits have those overlapping sections at the top of the shoulders (also called envelope or lapneck shoulder flaps)? I just thought that it was to be helpful for getting them over an infant’s head easily. While that is part of the reason, the biggest, most parent-life-changing reason is so that you can take the Onesie off of your child WITHOUT going over his head. You slip it off his shoulders and down his body. Anyone who’s ever dealt with a diaper blowout knows the beauty of this method! The very first time Isaiah wore a bodysuit, I took it off him this way, just to test it out. 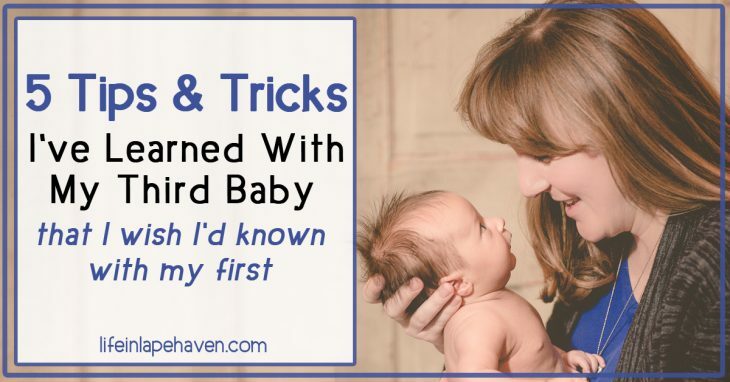 It was so much easier, especially with a wiggly, floppy newborn. And not only was it easier to take off that way, we found that in those first few weeks, it was actually easier to put them on him from the feet up. This was incredibly helpful when I discovered that Isaiah’s little sleeper gowns with the elastic at the bottom had the same kind of shoulder flaps. Those go on much easier from the bottom up, too! Here’s one of the videos I saw that show exactly how easy this method works. All babies cry. Since it’s their only way to communicate in the beginning, they do it a lot and fairly often. Knowing that is helpful, but knowing how to meet their needs and calm the crying is even better. Like most parents, Brad and I had found a variety of soothing techniques with our little ones mostly by trial and error or happy happenstance. For example, when Josiah was tiny, he loved the sound of the dryer running. We discovered this one day when he was crying, and Brad was walking around with him, trying to settle him down. One step into the laundry room, and Josiah stopped crying. Stepping out of the laundry room, he would get fussy again. 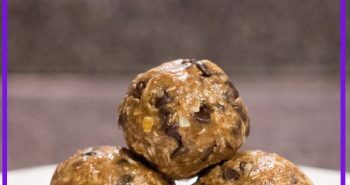 In addition, there was another video that you may have seen popping up in your Facebook newsfeed over the last couple of years that showed a similar technique to calming a newborn, and it was an idea that I held onto to try out, too. This method was demonstrated by a doctor as an almost immediate solution to calm a baby’s crying, and watching the video is rather impressive. So, of course, we’ve had plenty of opportunity now to try some of the ideas with Isaiah, and they worked really well – so well that I wish we had seen these videos back when our first child was born. 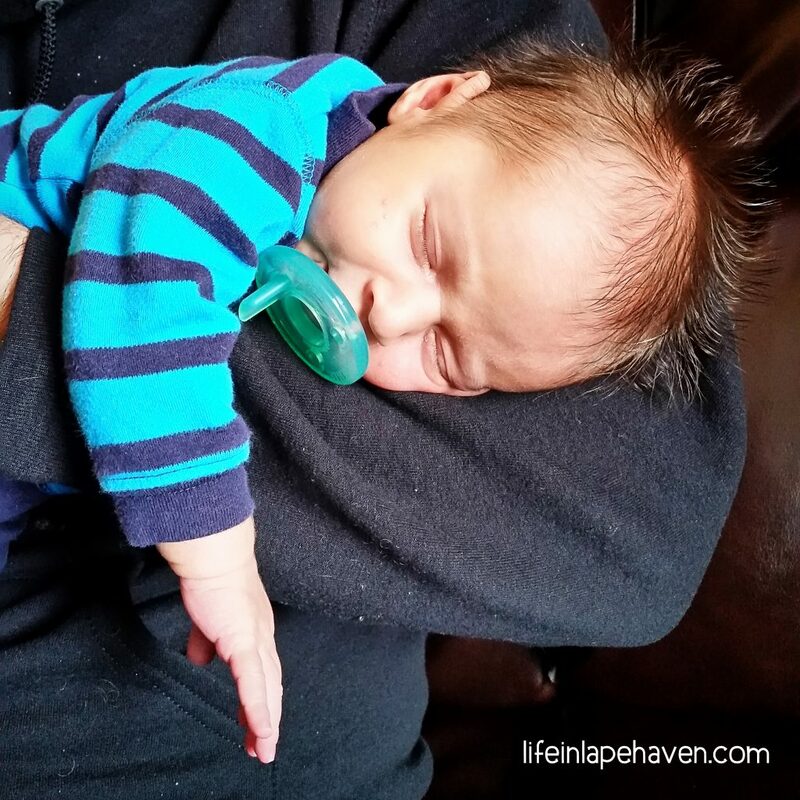 All of our boys have used some kind of swaddle or sleep sack, especially when they were first born. However, none of them have ever been particularly effective. The boys all did well at the hospital when swaddled tightly in a blanket, but at home we just couldn’t make our “baby burritos” as well as the nurses. With Isaiah, we started out with the same sleep sacks and infant swaddlers we used with our older two boys and ended up with the same results: a slightly restless baby, which meant a very rest-less mommy and daddy. Because Isaiah was a bit smaller at birth than our other two, I thought maybe a slightly smaller sleep sack would help him, so I started looking online at all the options. I decided on the HALO SleepSack Microfleece Swaddler because it not only came in smaller sizes, but also in a winter weight (my other two boys were spring babies, so they didn’t need a heavy sleep sack). The swaddle part of it was also adjustable to either have his hands completely in, partially in, or completely out, which proved to be exactly what we needed as he grew and developed over the first couple of months. The first night he slept in his new sleep sack, the difference was obvious. It fit him well, he was warm enough, and it swaddled him just right. He was much less restless and slept better and longer than in the other sleep sack we had. I found myself wishing we had tried this sleep sack with our older two. 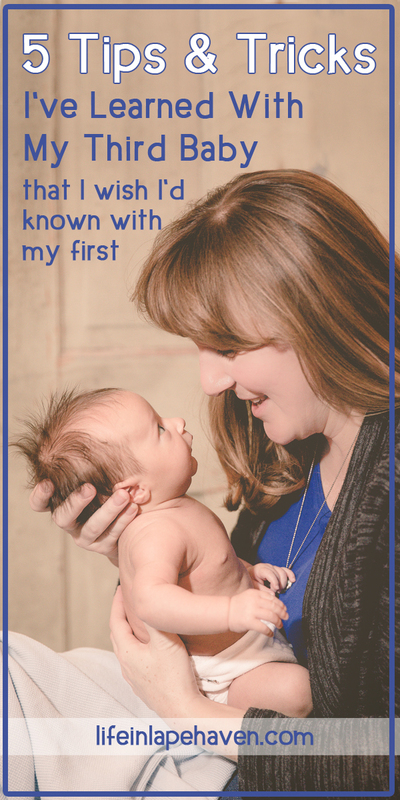 As a mom who has breastfed both of her previous babies for at least a year each, you would think I knew this one, and I did…sort of. However, when I was pregnant with Isaiah, I clicked through a few breastfeeding and nursing articles just as a refresher to help me prepare. While the one that I originally read is no longer available (the link doesn’t work), here are some of the articles that helped me. Foremilk and Hindmilk – What does it mean? Even reading over what I already knew was a fascinating reminder of how perfectly God created us to provide for our babies. No matter how you feed your baby, you’ll need to burp him. And I already knew how to burp a baby…only I didn’t. Of all the new things we’ve picked up this time around, this tip is BY FAR our favorite. I saw this video posted by a blogger on Facebook, watched it, and thought, “That looks funny, but it makes sense. Interesting.” It also reminded me of the calming technique from that doctor’s video. The day after we watched this burping technique, we were at Brad’s sister’s house for pictures and to visit the family since sickness in all our families had kind of postponed our holiday celebrations. When I tried out this burping method on Isaiah, we all noticed how it calmed him instantly. And I mean, instantly. My sister-in-law asked us if that was something we knew he liked, and I explained that we were just testing it out. It’s still working, and as he’s getting bigger, working us out, too! 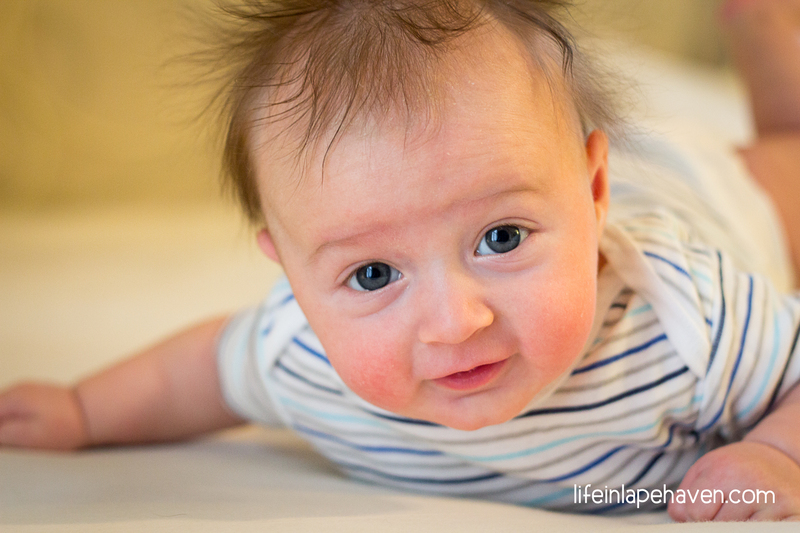 WHAT ARE YOUR FAVORITE TIPS & TRICKS FOR TAKING CARE OF LITTLE ONES? Feature picture courtesy of Picture Bliss Photography. The Foremilk and hindmilk link is broken.